Robert Kiyosaki once again teams up with Sharon Lechter as a co-writer in this 2004 publication directed at people who wish to control their financial destinies through becoming entrepreneurs. In Rich Dad’s Before You Quit Your Job, Robert Kiyosaki identifies the difference between employees and their bosses or entrepreneurs. The only difference is fear, and the perspective and identification with the meaning of job security. 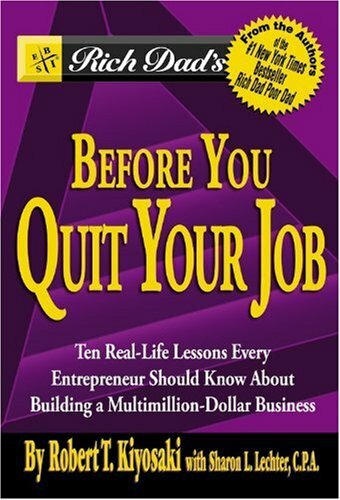 As in other works, Robert Kiyosaki brings back much of the philosophies of Rich Dad, Poor Dad, and his principles of the cashflow quadrant, but also gives examples of what not to do when attempting to become an entrepreneur. In Rich Dad’s Before You Quit Your Job, Robert Kiyosaki gives clear and straight forward stories leading to morals of what is needed for entrepreneur mind frame.